Insurance companies have recently been overwhelming consumers with a steady stream of humorous and creative ads. To determine exactly how excessive their TV commercials have been, Advertising Age teamed up with the social-TV analysts at Bluefin Labs to track and correlate their airings to their social-media mentions. This would provide a general gauge of consumer response to the individual campaigns and spots, as well as their frequency and broadcast patterns. 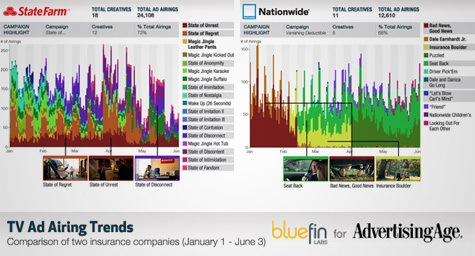 AdAge.com posted the following findings to uncover the methods behind their media madness. “Synchronizing commercial tracking with brand comments in social media can help answer strategic questions and, in turn, influence campaign changes in near real-time,” said Mike Guigli of Bluefin. The research focused on the television trends of two major insurance companies, Nationwide and State Farm, and monitored their campaigns from early January through early June of this year. The research revealed that State Farm commercials ran twice as much and had more individual rotations than Nationwide ads. Both companies ran two major TV campaigns during the six-month time period, with State Farm having twice as many executions for each. State Farm’s first and most frequent campaign focused on savings, convenience and customer service while the second showcased customers as they were rescued by agents. Nationwide’s first and most frequent campaign featured celebrity spokespeople promoting vanishing deductibles while the second showed celebrity spokespeople endorsing bundle savings. Despite both companies having two distinct campaigns, their strategies were completely different. State Farm continually had numerous TV commercials in rotation while Nationwide only showed two at a time. State Farm’s attempt to promote its diverse portfolio by appealing to a variety of target audiences was in sharp contrast to Nationwide’s strategy of focusing on more specific creative messaging and consumer markets. The goal of such tracking is to correlate specific airings to social-media mentions in order to measure how consumers respond to the commercials and campaigns, as well as to their overall broadcast patterns. Let MDG customize a marketing program to generate buzz and increase sales and marketing ROI for your brand. Contact MDG Advertising at 561-338-7797 or visit us at mdgadvertisng.com.